I designed this guy specifically for thread, but he works equally as well with yarn. Instructions are included for his hanging branch, which makes a fantastic necklace or hairband! 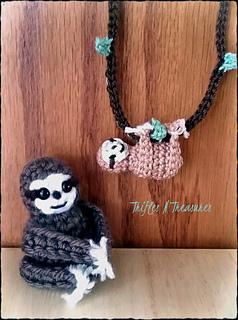 Now you can have sloth jewelry! Neither version takes much time, or yarn-just switch to a G hook and worsted weight yarn for a cute finger hugger or keyfob!